The atrei living in this region speak Nacateca. The Whites living in this region are descended from French settlers. In Coninipati there are also the descendants of Swedish & Danish settlers. Coninipati -- rainiest lesre, wet chilly forested mountains, 7 autonomous "tribes" plus French. 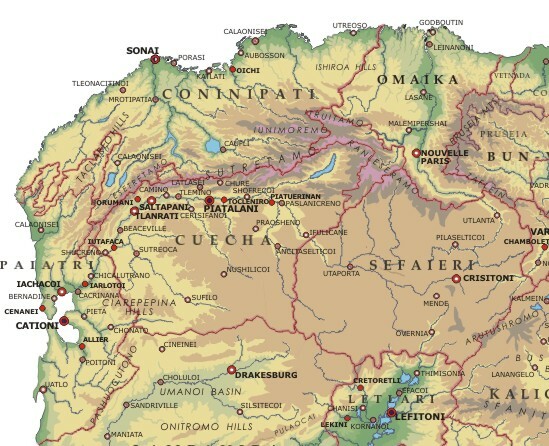 Cuecha -- plateau heartland of Nacateca culture, a big urban state, also a big wheat producer. Paiatri -- west coast, very urbanized, including the Clacupo Bays, rainy & lush. Omaika -- north coast, mountainous & hilly, forested, French influenced, very Catholic. Sefaieri -- big state on the central Ifuno plain, Berg's breadbasket, very Nacateca, few Europeans. Coninipati is the Nacateca, hence official, name, but the French and other Europeans have in the past called it Goninbad. This lesre comprises Bergonia’s northwest corner. It is a mountainous, wooded region. Most of the lesre is over 2000 feet in altitude, and half of it is over 4000 feet. The southern boundary of the lesre is formed by the dizzying high Sutretamo range, with icy peaks that reach over 10,000 feet high. The highest peak is Mt. Reshini at 14,019 feet. Temperate Rain Forests: The moist cold from the west rises and condenses as it strikes the steep hillsides. Because of the prevailing westerlies that are propelled by the jet stream from North America and the gulf of Mexico, Coninipati has some of the coldest-- and certainly the wettest-- weather in all Bergonia. Thanks to the westerlies and the altitude, Coninipati is the one region of Bergonia that dependably sees snow every winter. For centuries most Bergonians regarded the land of the seven tribes as an inhospitable land, a "rugged land where rain pours year round and chills a good man's skin. The confining hollows choke with dense mist," according to Baizen, the great traveler of medieval times. Modern men compare the rainy gray skies of Coninipati to that of the Washington and Oregon coast in America, but the summers in Coninipati are relatively dry and warm. Coninipati was always referred to as the Land of the Seven Tribes for the seven distinct tribes that have inhabited these mountainous precincts for centuries, with distinct dialects, customs and loyalties. Throughout Bergonian history these tribes have fought and quarreled with one another, but rarely to the point of disrupting their mutual trade. The tribes nearly always united against any incursion by the powerful, more civilized people of the Cuanita Valley and Ifuno Plateau. 70% of the population speak Nacateca, 21% speak French, 6% speaks Pasan, and 3% speak Swedish. The people of the Seven Tribes historically lived in small villages and raised cattle and sheep, farming enough grain for self-sufficiency, and also growing orchards and vineyards. They did not farm extensively and had no interest in exporting their crops. However they engaged in mining gold, iron and precious stones and traded these commodities to the Ancita people. In modern times, people have spoken of an "eighth" tribe, the French colonists who built cities along the northern coast in the 1600's and 1700's. During this same time the Swedes planted five settlements along the coast, four in Coninipati. Many of these colonists came from Norway under Swedish auspices. There are still 204,000 Swedish speakers, and whenever the subject comes up they insist that they should be counted as a "ninth" tribe, but most of the natives wave their hands dismissively and say that all the Europeans together comprise the eighth tribe. Nevertheless the national flag has nine, not eight, stripes. These european settlers became logger, traders, fishermen and ocean voyagers. Many of them became whalers in the 1800s. 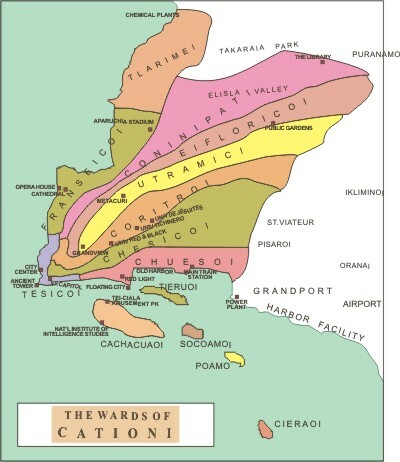 Coninipati was traditionally organized into ten counties. In the last century the ten counties were broken up, yielding smaller counties, in order to bring government closer to the people, but the ten counties remain sentimentally significant to the people of Coninipati to this day. Each of the seven tribes had its own county. An eighth county was called County du Baie, and stretches along the northern coast east of the large capital city of Sonai. This county's boundaries were drawn so as to delineate the French and Swedish settlements along the coast. The ninth county includes the city of Sonai and its environs. Sonai is by far and away the largest city of the lesre, with a population of 1.3 million. Sonai barely existed in pre-European times, but in colonial times it grew to be a significant port, not to mention a center of French culture. Here started the great rebellion against British rule. Afterwards Bergonia’s first congresses met in Sonai, specifically in the ballroom at the colonial governor's palace. The floor in the ballroom consisted of an alternating pattern of red, white and black tiles, a pattern that now survives on Congress’s flag. The tenth county is Clunero‚ along the west coast, has a very sparse, ethnically mixed population. Green hills with sharp slopes run in straight ridges parallel to the coast. Fog and mist are common. The hills are covered with a dense layer of fir and laurel. The valleys cradle some of the best vineyards in Bergonia. 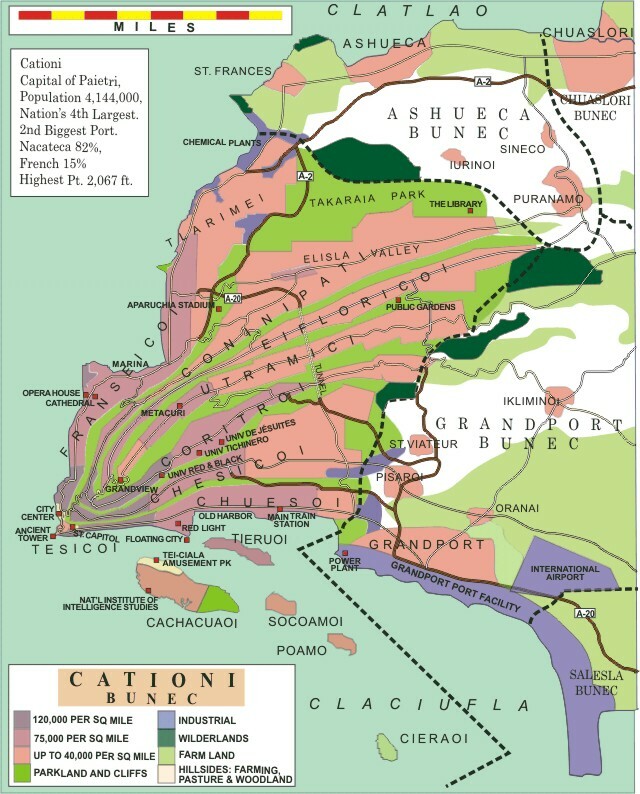 This region constituted the northern part of the ancient state of Siufana, a Nacateca state that shared in the mainstream Bergonian culture, unlike the extremely iconoclastic seven tribes. The ancient Bergonians all agreed that Siufana produced the very best wine. This had to do with the comparatively dry summers. Unfortunately Siufana suffered one of the highest death rates during the awful plagues of the 1500's, when the Europeans brought smallpox and other horrible plagues to Bergonia, and Siufana turned into an utter wilderness as a result of the near total depletion of the population. Many of the surviving atrei thereafter divined that Siufana was haunted, a land of miasmic mists of ghostly sadness, a virtual republic of ghosts. But in time, members of the seven tribes, as well as French settlers, all drifted into this beautiful though incredibly damp hilly region and renewed the tradition of growing grapes and making wine. Paiatri "pai (as in "pie")-ah'-tri"
This lesre extends along Berg's west coast. The terrain is almost uniformly hilly except for a narrow costal strip. The hills were thickly forested, by virtue of the moist westerlies that blow year around, but over the centuries the hillsides have been denuded by farmers who now grow corn, grapes and vegetables and raise dairy cattle. The hills have in centuries past been terraced in many places for agriculture. In the last 70 years the state government has promoted reforestation, especially in the Ciarepepina Hills. This remains a lush area, with heavy year round rains. 85% of the population speaks Nacateca, and 11% speak French. Along this coast is a gap, a strait that connects the ocean to two round bays, with a rocky peninsula jutting out to separate them. This combined body of water, and the surrounding basin, is called Clacupo. The northern bay is called Clatlao and the southern is Claciufla. The great river Cuanita flows into Clatlao. Around the shores of Clacupo are numerous cities, which together make the area one of the most densely populated regions in Bergonia. Here one finds huge amounts of shellfish, though for most of the 1900s the waters were so horribly polluted that nothing living in these waters was fit to eat. Thankfully, because of a Harmony Party government, great strides have been taken to restore the health of the waters, so while tankers and other commercial vessels still ply these waters, they now yield delicious seafood. In the late 1800s and early 1900s this region also suffered near total deforestation because of extensive timbering and intensive small-plot farming. Both before and after the 1931-34 Revolution Paiatri suffered serious industrial pollution. Toxic waste and brownlands were particularly serious, since Paiatri was a major location of chemical plants. 1) Tesicoi, "the Tower," is the quarter at the tip of the peninsula, named after the picturesque light tower erected surviving for 1100 years, situated on the very last tip of peninsular land. This the downtown, center of socialist commerce, location of the Lesre capital, home of foreign trade brokers and cooperatives, and location of one of the oldest colleges in the country. In 1988 the last automobiles were banned from the city center. 2) Chuesoi, "the Docks," as the name suggests, include the waterfront along the south side, where the old port prospered for centuries. Now, to the east of the Docks is the new town of Grandport (a French name), with a huge port suitable for today's container ships. Cationi was a center for the whaling industry in the 1800s, and in the Docks there appeared a torrid red light district that has kept the nation perpetually scandalized and amused. The red light district still exists, with open bordellos, strip clubs, "pothouses," bars, dance halls and "fight clubs," though in the modern, more free-wheeling Bergonia it is almost as much a tourist center as anything else. 3) On the waterfront along the north side of the peninsula is Franseioi, the "French Quarter," a center of French culture since colonial times. There are plenty of neighborhoods with well-preserved buildings surviving from colonial times and the early 1800s. There was never commercial shipping activities permitted here, this having been the rich section of the city during colonial and republican times. Of course now this big dense tangle of streets, with neighborhoods full of high rise apartments, some as high as 10 stories, is ethnically dominated with Nacateca atrei, with the French now a minority. The architectural beauty in the old waterfront neighborhood, with its "hundred inns" brings thousands of tourists every years, and the local ward governments have accommodated tourist interest by sponsoring elaborate floral gardens on every available square meter of land. Built into the white cliffs is Aparauchia Stadium, capable of holding 120,000 people, home of the city's American football team. 3A) Northward along the coast is a thoroughly un-French polyglot of Nacateca fishermen and shipbuilders, Minidun immigrants, an English-speaking neighborhood of American and British radical and semi-criminal expatriates, a large transient neighborhood, a neighborhood of Portuguese, and in recent years the gay district. O Carvalho is a restaurant in this latter neighborhood, and consistently is rated by Zeguna, the national restaurant guide, as one of the nation's ten best. This great mélange is called Tlarimei, "the Warehouses," and itself draws considerable interest from travelers. The city's theater district is located here as well, surrounded of course by blocks of trendy and trashy bars and clubs. Yet this is the most industrial and the grittiest part of the city-- on the northern limit of Tlarimei, separating it from the adjacent countryside, is a complex of chemical plants. 4) The tenements built upon the first ledge on the northwest face, and then spreading northward to fill the high, broad Elisla Valley, all together comprises the big residential quarter called Coninipati, for the lesre of the same name. These neighborhoods look down on the French Quarter. In pre-Columbian times workers immigrated from among the Coninipati tribes and settled on this higher ground that had once been agricultural land, descending to the rich city below to work as servants and laborers. Now the folks living here are generally Nacateca natives who commute either downtown or to Grandport for their work. There is a high speed highway tunnel and two subway tunnels punching through the peninsular rock connecting Coninipati with Chesicoi/Hillside, and hence on to Grandport, making the daily commute simple and quick. 5) The seeming endless rows of stucco townhouses, characteristically painted from an endless variety of pastel hues built along the first, very wide ledge on the southern side of the peninsular ridge, the streets following the contours, are simply called Chesicoi, "Hillside" as if this were the only hillside in the city. 6) "The Gardens," Eiflorioi is the beautiful district situated on the second ledge on the north face of the ridge, looking down on Coninipati and the French Quarters. It was the district where the rich built their homes before 1930. Many of the mansions have been carefully subdivided into multiple units, while others are allocated to large extended families. In keeping with socialist allocation according to need, many of the old buildings have been institutionalized, now the locations of group homes, orphanages, temporary housing, schools, offices, and many others used as residential collectives. 7) On the second ledge on the southern face is Coritoi, the University Quarter. Cationi has always been a town of colleges, philosophers and learning-- hence on its flag is portrayed a book, with a dove emerging from its pages, and the sword of state protecting the eight stars arrayed in an arc above. 8) The ridgetop is the Utramici, the Summit, the neighborhood that looks down on everyone, it is the smallest of the wards, a long skinny zone delimited by the cliffs on either side, that essentially spits the city into its northern and southern halves. The view from here, at 2000 feet, is magnificent. This wards is primarily residential, with many small houses and apartment buildings, nearly every one of them with a balcony, and every window with working shutters. The breezes and the stormy winds blow stronger at 2000 feet above sea level than below. In recent decades telecommunications facilities and enterprises were sited on this high spot. The tourists all make the obligatory ascent on the elevators all the way to Metacuri, the high lookout 2250 ft high from which one can see the entire city, spread out 360 degrees around, surrounded on three sides by blue water. Since ancient times this ridgeline has been connected by road to the nearby highlands, where farms and pasture alternate with forest, and as such has always been linked to the productive countryside. Thus, over the centuries there has been located on the Summit crematoriums (in pre-columbian times), agricultural markets, sawmills, tanners and slaughterhouses, and until 30 years ago a coal burning power plant. 9) Although there have traditionally been only eight wards one cannot overlook the four substantial islands off the southern coast. Three are urbanized, with high population densities, each with its own economic base. The largest of these is Cachacuaoi, over three miles long, where one finds Tei-Ciala, one of the nation's largest and most popular amusement parks. At night, its lights present a stunning sight from the mainland city. The fourth, and most report of these, is Cieraoi, which is rural. Cationi's old small port now handles only a fraction of the tonnage that passes through Grandport, the modern facility. The town of Grandport is only a hundred years old, and still remains small. Unlike the big majority of Bergonian cities, there is quite a lot of commuting here-- thousands of the longshoremen working the docks at Grandport commute from their homes in Ceiolai's dense neighborhoods. The port facility itself stretches 25 miles along the coast. Railroads fan out from Grandport to all parts of western Bergonia. Cationi's regional economy is based primarily on commerce and shipping, with a considerable percentage of the goods produced in western Bergonia passing through Cationi and the other Clacupo cities for export. Taken together, the Clacupo cities comprise Bergonia's second largest port, with only the east-coast port of Glen, in Halemarec, moving more tonnage. Sefaiari's moist weather permits a great deal of farming, primarily intensive truck farming producing subtropical fruit and vegetables, a great deal of which goes to export. One cannot underestimate the nation's reliance on ocean shipping for its domestic transportation needs; if goods produced in Sefaiari have a buyer in one of the eastern cities, it may make as much sense to put the goods on a boat as to ship by rail or truck. Cationi has always carried a reputation for openness, excitement, rebelliousness, licentiousness, criminality and danger. In pre-columbian times Cationi was a great hotbed of speculative, original and sometimes heretical thinking. Most Shufrantei heresies originated in the Clacupo cities. Cationi was headquarters of the heretical Bell-Ringers who fled the armies of Eluesi Praxai and sailed down the coast in a makeshift armada to ultimately found the state of Pueoi in southern Bergoni that became a major power in medieval times. The Clacupo region was also the birthplace of the selone movement. It has always been a place where philosophers feel comfortable. Even now Cationi was one of the first nations to vote Harmony, and Harmony has as a result largely dominated Sefiaeri politics for 25 years. Solar panels are on rooftops everywhere; now this city produces 25% of its own power by solar cells. In the Tanic era its library was among the largest, most magnificent in all Bergonia, sprawling over twenty acres. It was destroyed in colonial times after most of its books were transported inland by natives determined to preserve them from foreign, desecrating hands. Now in the city of Chonato, in eastern Paiatri, is located the Porei Saminolei Imaliacai Loie Sare te Ichoie, the "Permanent Institutional Library of World Knowledge and Culture," more commonly called the Permanent Library, the largest single library in the world, dedicated to serving as an "ark" for world culture incase of nuclear war or some other cataclysm. The Permanent Library now has a huge ranch in Cationi, strung out over several locations in the University ward. There are other cities located around the calm, protected waters of Clacupo, while Ceinanei is the only big city facing the ocean directly. It lies on the peninsula that separates Clatlao from the open sea. Ceinanei is a modern city. There was no city here until the 1600s, and then grew as a center for commercial fishing. Ceinanei is now a center for production of machine tools and computers. It also has a seven-mile long, very fine beach, lined with small hotels and manicured palms, to draw vacationers, who also come to visit Joie-Joie, one of the nation's largest amusement parks, where common citizens-- the ones lucky enough to win the special lottery drawing-- can ride in real fighter jets flown by military pilots. There are three cities located virtually adjacent to one another along large, important the Cuanita River, between the border with Cuecha and the mouth of the river where it flows into the Clatlao bay. These cities are strung like four pearls together. Just southwest of the border is Chicalutrano, a small manufacturing city of 230,000. The next city down river is Iarloto, population 744,000, with many large steel mills and chemical plants, some over a hundred years old. This city has always had a well-deserved reputation for being dirty and bleak, but like many other industrial cities it has a muscular civic pride that shows in so many ways. The third city is Cacrinana, a port city; this has been a port city since the arrival of the French in the 1500s, and they made it a power center. Thus there is a fine colonial-era French Quarter on part of the waterfront. To the west of Iarloto along the northern coast of Clatlao is a city called Iashacoi, a great shipbuilding center. With over a million people, Iashacoi the second largest city in the Lesre, and certainly one of the most modern. It developed as a center for wood products, drawing upon the productive timbering of the forests in Suifana and western Coninipati, and then as a shipbuilding center. It has one of the most diverse manufacturing bases in the country, with a number of large chemical plants, and is also a secondary port to back up Cationi-Grandport. The lesre of Sefaieri is the heartland of Bergonia. It is east of the Ancita heartland in Cuecha. It is west of Rarsecin and Zeinran, the centers of Minidun culture. It is north of Letlari, whose capital, Lefitoni, is also capital of the entire nation. Sefaieri is territorially the second largest lesre in Bergonia, exceeded only by Lampanira, but its population is only 4,700,000, ranking 19th. This population is primarily rural, with only five cities of more than 50,000. 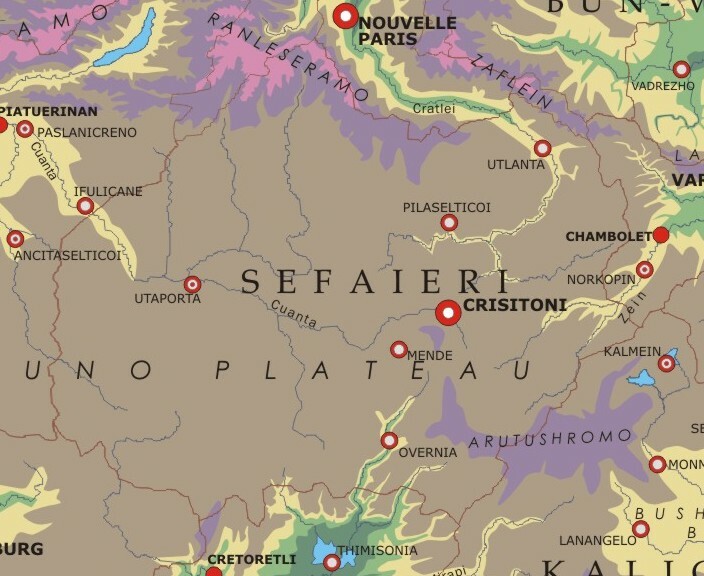 The capital and largest city is Crisitoni, population 1,409,000, home to one out of four of Sefaieri's people. There are some areas with a population density of less than 50 people per square mile. Crisitoni is an old venerable city. Its earliest settlement was by Banda warriors from the area of Tlanrati in approximately 350 B.C. The settlement was sacked a number of times in the constant internecine warfare that prefigured Banda society. By 300 B.C. the early Ceiolaians had begun a pattern of trade with Crisitoni. Around 100 B.C. gold was discovered in Nanetlamo, the great mountain located just a few miles way from Crisitoni. Since then Crisitoni has reigned as one of the most important cities in Bergonian history. Crisitoni was never the center of any great empire or state, but it prospered as a financial center whose noble families reaped huge profits from the sale of gold and silver. One of these families, the House of Oreileca, created a vast network of trading houses in the height of the medieval era, stretching from coast to coast, and their name lasts to the present day as a metaphor for fabulous wealth. The Crisitonis did not exhaust the sumptuous mines until 1150 A.D. Afterwards, Crisitoni faded in comparative stature, relying solely upon its strategic location and its value as a trading center. It is now a city dependent upon both agriculture of the lesre and its industry, which includes steel and aluminum mills, food processing plants, and factories at the manufacture of farm implements, trucks, and tools. Crisitoni has an extensively preserved and restored Old Town, boasting over a square mile of temples, palaces, office buildings and monuments from the Pre-Columbian era. Most of this lesre consists of a flat plateau where the country undulates between broad flat valleys where wheat is grown and higher rolling country where sheep and cattle graze. On the slopes in between are sheep farms. The average altitude is 3,000 feet, while the towering Nanetlamo touches 6,000 feet. The chestnut brown soils are good for wheat. In medieval times a powerful and rich state rose here after the relative decline of Rarsecin to the east and Tiericoatli to the west. That state was Pusuraino. It stood as one of the great powers during the time of the Miradi prophet, Krathnami, and then later during the Tan era. Utaporta is a city of 428,000, and home to Utaporta University, one of the great Academies of the commonwealth, a huge sprawling campus of elegant stone and red-brick buildings from a variety of eras, from pre-columbian Tan Era to the present day, all following the same tradition highlands style of many skinny windows with shutters, steep prominent rooftops, archways and verandas. It is an ancient school, founded by the Mrilitashri priesthood in 879 A.D. It now specializes in Law, Architecture, Music and Arts, and Geology and Mining. Tourists come in large numbers to see the pyramid complex exists in a valley called Faotilacoi, located in northeast Sefaieri. As they make their approach they see the three stone pyramids clustered together on the banks of a long manmade reflecting pool. The ancient builders constructed the pyramids, the pools and the road to produce a stunning effect on the visitor. These pyramids are actually crematories, with leveled tops where the pyres are built. Great stone steps lead up the sides of the pyramids. The largest pyramid, in the middle, is dedicated to Arkan, the solar diety. The slightly smaller, second one is dedicated to Icotesi, the female lunar queen of the universe. To the other side of Arkan's temple is the smaller pyramid, dedicated to Mara, the chief funerary deity. A raised walk of marble joins the three. The walk connects also to a series of four marble temples. One small temple sits between the pyramids and the reflecting pool. This small, elegantly proportioned temple was built for private meditation and prayer. It houses an inner sanctum that contains a bracelet and an amulet worn by Ierecina himself. Close by to the complex are five monasteries built during the Tan period, in the early 1400's. A second pyramid complex, almost identical in its layout of three pyramids exist at a place called Porutlicoi‚ along the course of the Cuanita River. It is different, however, in the absence of temples close by. However, a half-mile away across the river are several small temples, each with a sanctorum housing relics from the prophets. Each of the prophets had a temple dedicated to him, nine in all. Porutlicoi is located fifteen miles downstream from the city of Utaporta. The pyramids of Egypt served as tombs, while the pyramids of Mexico were sites for human sacrifice. The pyramids of Bergonia existed as settings for the new set of rites which the Prophet, Ierecina, founded. He established a theocratic empire and anticipated that the emperor would annually perform rites of purification at these temples that would touch the spirit of the entire empire. Even more importantly, the Shufrantei used the pyramids for funeral pyres, men cremated on Arkan's pyramid, women on Icotesi's. As things turned out, his empire did not last, although his faith endured for centuries. Ierecina had another purpose in mind, however, when he commissioned the pyramids, a function that has lasted until recent times. His religion mandated that the dead be disposed of by cremation, since the burning of the body allowing the release of the soul and the smoke carried the spirit heavenward. The pyramids were designed to serve as great crematoriums and the tops of the pyramids were flattened so that the devout could build pyres. The priests cremated men atop Arkan's pyramid and women atop Icotesi's. Only special holy men and children were cremated on Lacori's. The northern part of Sefaieri, consisting of the bunecs of Epiuresi, Cireatlaosi and Shupetlo, is extremely rugged. Along the northern border with Omaika the plateau ascends to meet the high range of mountains known as the Raneseramo, with peaks of 8,000 to 10,000 feet. The mountains are rocky, presenting wildly magnificent scenery much like the Dolamites in Italy. The steep hillsides confine the sparse population to twisting narrow hollows and ravines and to windswept ridge tops . The region is covered with dense forests of spruce, pine, oak, and maple. In the uplands one finds intermittent alpine meadow. These three bunecs possess a unique character because of their high concentration of Miradi monasteries. The three have come to be called Chupuokami, the refuge of the saints. The total population of the three bunecs is only 170,000 and fully 32,000 of these are monks, priests and priestesses. It is called Bergonia's version of Tibet. The concentration of monasteries in Epiuresi, the most northern and mountainous of the three, is so great that the ecclesiastics have a formal role in government. They have enjoyed such a role for centuries in varying degrees as greater powers allow. Currently, the lesre congress permits them to appoint a third of the bunec council seats, and approve appointments to certain posts. There are sixty monasteries in Epiuresi, most dating from the Tan era. Each of the monasteries has a generous endowment of land fertile for pasture, forestry and crops of wheat and oats. The religious and their lay employees (organized in cooperatives, of course) work the land and engage in cottage industry. Through such endeavors the monasteries support themselves without aid from any other source. Thus, the monasteries are independent from any other branch of the Miradi church structure. They offer a haven to Miradi devotees from the stressful rigors of modern life. During their retreats the devotees can pursue the practices of meditation, intense prayer and purification. The greatest of the Miradi mystical ways are pursued in the monasteries. and priest and priestesses from all over Bergonia come to Chopuokami for enrichment of their faith. Aside from the convocation of priests from all over Bergonia in Chambolet every four years, the most estimable Miradi institution is the Eight Flags of Faith. This is the collective leadership played by the eight monasteries whose size, excellence of service and stature of tradition attract the most respect. Their eight abbots are recognized as the chief religious authority in matters of faith and morals. The significance of Chopuokami can be measured by the fact that three of the eight monasteries are located there. Just south of Crisitoni one can find the headwaters of the Serofi River, one of the three great rivers of Bergonia, which flows southward through the state of Pueoi to the sea. Here the Ifuno plateau rolls at an average altitude of 5,000 feet. As the river flows south it quickly drops into a deep gorge, and digs out an impressive canyon on its way southward. The canyon walls stand a shear 2500 feet high, and further south even higher. The valley at the canyon's bottom is never more than 2000 feet wide, and has been the scene of many fierce floods. Notwithstanding the narrowness of the canyon, a remarkable city, Overnia, has grown up in the widest place in the canyon. Overnia, now a long skinny city following the river, supports 170,000 people who work in meat packing plants and on the major railroad that follows the river, and because of the occasional flooding much of the city is built up on piers. Distracters complain that Overnia is the darkest city in Bergonia because of the high canyon walls, saying, "The sun sets at three in the afternoon and doesn't rise until ten the next morning." Yet hundreds of thousands of tourists come every year to see the sunlight reflecting off the orange stone walls of the canyon. Cuecha is the largest state in population. It is the Nacateca heartland, the home of the Ancita Nation that in ancient times exploded with the energy of the Shufrantei religion. It is the site of some of the oldest cities in Bergonia. It abounds with ruins of ancient days—just a few desultory stones strewn among the clay in some places, in other places one finds whole preserved cities. This is a fabulous place for amateur archaeologists. The great central plateau known as the Ifuno stretches from the Spichel Mountains in the eastern end of Bergonia to the western coastal foothills. Cuecha includes most of the western part of the Ifuno. Its western border runs through the highest peaks of these hills, the Ciarepepina Hills, approximately 4000 to 5500 feet in altitude. Its northern border runs along the crest of the Sutretamo Ridge, approximately 7500 to 9500 feet in altitude. The highest peak located on the border is Mt. Furitle, at 12,766 feet. Just north of the border is the highest of the Sutretamo peaks, located within Coninipati, Mt. Reshini at 14,019 feet. The southern border runs just north of the southwestern rim of the Ifuno. 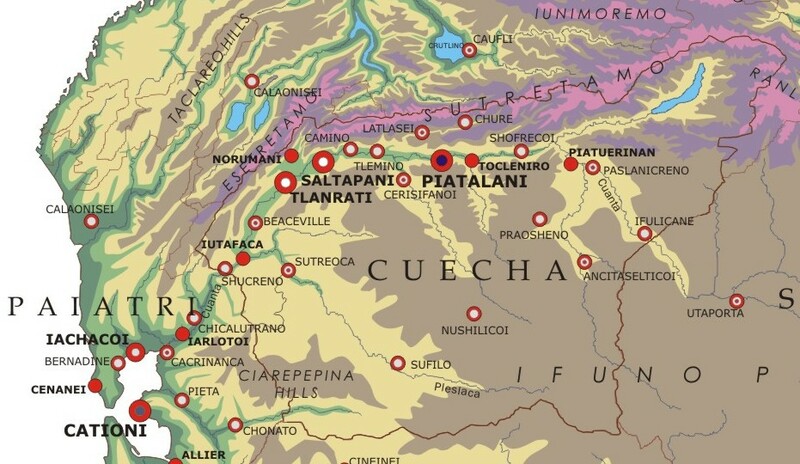 The Ifuno plateau within the bounds of Cuecha gently rolls at altitudes of 1700 to 3200. The mighty Cuanita River traverses the lesre, from east to west. It originates in the state of Sefaieri and flows westward into Cuecha, veering to the north and then abruptly falling into a deep valley of 500 to 700 feet less in altitude than the surrounding countryside, with a wide bottom that yawned as wide as five miles. This valley parallels the Sutretamo Mountains all the way to the coast. Waters melt from the ice capping the peaks of the Sutretamos and feed the Cuanita. Of the large states, Cuecha is decidedly the least Europeanized, with a population 95% Nacateca. All throughout the 1800s Cuecha hosted all the nativist movements, including the Zaomitan and the Mountain Lion. In the 1920’s most Cuechans rallied in favor of the Kilitan. Here even many anarchist trade unionists swung their allegiance to the Kilitan. When civil war broke out between the Kilitan and the Democratic Front in the Spring of 1931, the Kilitan easily occupied all Cuecha and established its capitol in Biatalani. After the Kilitan’s defeat many in Cuecha felt like they lived in a conquered province. The Kilitan ideals of national power and institutions more easily transferred to the NDP, but over the decades Cuecha has shifted toward SFP. Harmony is slightly weak here. This is one of the strongest states for the Socialist Country Party. First the town of Ifulicane, a small university town on the banks of Lake Feturicaio, created by a dam built in the 1940s. It was stupidly conceived and interfered with the health of the river. During the radical environmental reforms of the 1990s the dam was taken down, the lake drained, and the natural contours and watercourse restored. A much smaller, more naturally viable lake was planned to the side of the river and remains today. The land that was once Futuricaio is now new farmland. Second are the twin cities of Paslanicreno and Piotuerinan. Paslanicreno's center is situated on the corner of a massive botanical garden over two square miles in size, called the Garden Squares. Piotuerinan by contrast is an industrial city, with auto plants. One city is lush, the other hard-edged and grim. Between them there has simmered a good-natured rivalry over the centuries, and the grudges between their sports teams are intense and a little insane, but the residents of either one are hotly defensive of the other whenever people talk, because at heart they regard themselves as living in a single city. Third is Shofrecoi, a smaller city, and a very ancient one, with one section of its ancient wall still standing, along with some foundations and walls remaining from ancient times. Its proud roots intertwine with the history of the Hawk Clan. Its flag portrays a white hawk against a green field. Archaeological excavations in the center of town have revealed ruins dating 3,300 years old, making Shofrecoi one of the oldest inhabited places in all Bergonia. It is only appropriate that Shofrecoi University has one of the most outstanding archeological programs in the country, and it sponsors a Museum of Antiquities that offers to the public the largest collection of anthropological, archeological and paleological finds, with bones, arrowhead, tools and shards from the first arrival of homo sapiens in Bergonia, through the Neolithic transition to the ancient age of the first cities, up until 700 BC. It is sad to note that all throughout the literature of classical Bergonia, Shofrecoi was typically-- and probably unfairly-- described as a place of very unfriendly people. To this day the citizens of Shofrecoi rankle at this age-old reputation, and they seem to compensate for it with a hospitality that endears their city to most visitors. Their annual public drama includes the old grumpy man (or God) with a cane who silently but generously provides for guests, while happy smiling cloying people offer little to the guests and then try to cheat them. The guests ultimately flee to the unpleasant company of the grumpy old man of Shofrecoi. Fourth is Tocleniro, a big, very plain industrial town. Just upriver from it are the extremely well preserved Cholerasentai Ruins, the remains of a Lasa city from before the Shufrantei era, excavated in the 1950s. Fifth is Piatalani, the capital and a city of 3.628,000 people. The city is one of the most homogeneous of all the large Bergonian cities, being over 90% Nacateca, and a very small European community. Piatalani is the capital of Cuecha, and one of the great cities of Bergonia. As a center of media and publishing it is regarded as the capital of Nacateca culture, The Shiaca-Piatalani, translatable as the Piatalani Crier, is one of the nation’s leading newspapers. Over the centuries Piatalani has been home to many Nacateca artists and writers. The city is very proud of its importance to Nacateca culture and history. Archeologists have recovered from the city center artifacts dating from 2000 BC indicating urban settlement. It was one of the Lasa city-states and one of the first cities to submit to Ierecina. 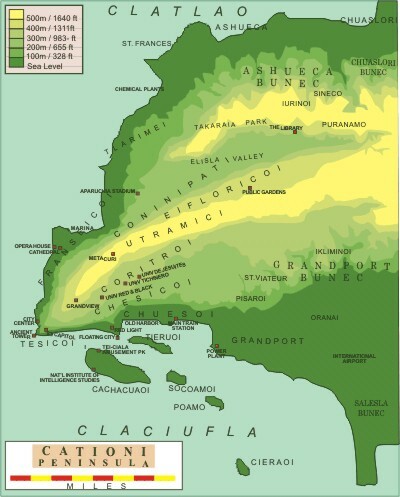 It grew in size and prominence when the short-lived but glamorous Necruruean Empire moved its capital there. After the empire’s collapse, Piatalani was for one thousand years the capital of the powerful state of Tiercoatli. All during colonial times Piatalani was ruled by a native dictator under a French, and then British. At the center of this bustling city one finds many well-preserved brick and stone buildings dating from ancient and medieval times. Located downtown is the Piatalani Museum of Arts and History, second largest museum in the country, housing an outstanding collection of art and historical and anthropological artifacts from throughout history. Stretching along the banks of the Cuanita River is the campus of Nacateca University. With an average enrollment of 90,000, Nacateca University is for Bergonia a combination of MIT and the U. of Texas. Piatalani is an economically diverse city. It is home to truck and locomotive plants and appliance factories. Its airport is the basic hub for the entire western half of Bergonia and its airport and airline maintenance facilities employs over 70,000 people. The streets are typically straight and wide (although not on anything remotely resembling a grid), with grassy and flowery medians, lined with trees, and fine large apartment buildings with stores on all the first floors. This city has a fetish for public statuary; in capitalist times the moguls erected many statues, including a number of fine items imported from Europe. The city government in socialist times has followed this practice, so that virtually every city square is home to a fine statue. Sixth is the small ancient city of Tlemino, just down river from the Itlar Pyramid complex, which crawls with tourists. Tlemino sits at the confluence of the Matlosoi River, which flows from the steep foothills of the Sutretamo Mountains. Along this river are situated the cities of Latlasei and Chure. Chure, tucked up against the awesome Sutretamo Mountains, is a great skiing destination. Seventh is the small city of Camino, often voted one of the mot beautiful cities in Bergonia. It is home to the second largest annual cycling event in Bergonia (the first being Tour de Bergonia), and the nation’s largest annual event for amateur cyclists, attracting over 150,000 cyclists. Eighth are the triple cities of Satlpani, Tlanrati and Norumani. The latter is not situated along the banks of the Cuanita, but to the north, where the Cuanita valley flares into a basin forty miles wide. This basin, containing these three cities, comprises a county called Muonlati, which throughout all medieval pre-Columbian history fiercely and resolutely asserted its independence. All three of these cities together boast a population of 4.0 million people, virtually all Nacateca-speakers. The northern border of Norumani is within seven miles of the Coninipati line that runs along the high granite ridge of the Sutretamo. Smack in the middle of the three cities is a small protected forest, serving as a green zone separating them and defining their territories. Tlanrati is named for the spider clan, and its flag reflects a stylized emblem of eight white rays, representative of a spider, superimposed on a red and gold field. Tlanrati is a university city, home to the University of Tlanrati with 65,000 students. The University not only offers a full range of arts and science programs, but it is also the home to both the National Academy of Nacateca Language and the National Academy of Physics and Electricity. Ninth is Tuislori, a very small city, known for its wine industry. Tenth is Beaceville, founded by the French. Forty percent of its population is ethnic French. Beaceville is the see for a diocese, housed in a beautiful Gothic style cathedral, and famous for its ceramics. Eleventh is Iutafaca, located where the Pleslaca River joins the Cuecha. This city had a distinguished Pre-Columbian history, but nothing of it survived architecturally, and now it is very industrial, and quickly forgettable. Twelfth is Shocreno, located on the border with Paietri, another town noted for its wines, pretty, with many buildings of rough mortared brick, archways and porticos, its city center situated between the Cuanita and a nice little lake formed by damming a tributary. The city is exceptional for the pines and laurels that thrive in its peculiar soil. South of the Cuanta valley extends the western part of the Ifuno plateau, a great elevated plain like the Colorado Plateau in Arizona. Most of this part of Cuecha was in ancient times called Sufila. The average altitude of the plain in Cuecha is around 2,500 feet. The plateau rolls and undulates, and the soil is brown and rich. In ancient history the Ancita flourished here as sheep and goat herders. They made the Neolithic shift to agriculture, when the domesticated grains and beans, but they always identified themselves with herding. With time, as the population grew, this became farming land, populated by peasant villages, producing enough harvest to feed the cities throughout all the eras of Bergonian history. Of course the winters can get cold here. There are two crops of wheat harvestd every year. The Ancita people originated here on the western portion of the Ifuno. Here the Ancita people evolved the pantei warrior class. From here they moved into the Cuanita valley and took over the Lasa cities. It was here that the great Prophet Ierecina lived and began both his ministry and his program of conquest. Thus it was also from here that the Shufrantei Religion sprung forth and spread all throughout the civilized parts of Bergonia. Ierecina established his capitol and built his temple in the holy city of Anctiselticoi, and it became the symbolic hub of the Shufrantei faith, drawing pilgrims from all over Bergonia to pray in the vast plaza between the great pyramid and the temple. This city still exists and is one of the great tourist attractions of the nation. Ancitaselticoi is the site of the most impressive, well preserved examples of ancient architecture in Bergonia. Its main center is still dominated by the buildings and pyramids constructed in the Subanei times and during the Necrurue Empire (from 300 B.C. to 600 A.D.) Ever since, the successive waves of conquerors, rulers and leaders have all revered these buildings. These buildings have suffered very little vandalism, and the forces of nature have spared them as well. These buildings are in better shape than virtually any Roman ruin (save for the Pantheon), the Acropolis, any of the Mesoamerican sites, or any site in East Asia. Some have quarreled with this claim by pointing out that the successive generations of Bergonians have kept rebuilding sections of the buildings, the walls and the towers whenever stones cracked or fell. The southern part of Omaika comprises the middle reaches of the Cratlei River. This is one of the largest coal producing areas in Bergonia. The coal is mined chiefly from the northern slopes and of the Ranleseramo Mountains and the adjacent foothills that come down to the river. Along the course of the Cratlei River near its mouth is a dramatic geologic formation called the Tuntatat‚ ("Two Hands"). It consists of two gargantuan granite slabs standing straight up, with the Cratlei flowing between. The granite rises up to a spectacular height of 230 feet. The river is usually about 700 feet wide along its lower course, but as it passes between the Two Hands the channel narrows to a mere 90 feet. The river is navigable, so both barge and passenger shipping must pass between the Hands. Like all the lesre located along the northern coast Omaika receives abundant rainfall. The summers tend to be drier that the winters and the autumns, but there is no pronounced dry season like in the east of Bergonia. Omaika is thus covered with deciduous forest, punctuated in the higher regions with groves of pine and fir. The hilly terrain and cool moist climate have abetted the development of healthy dairy and sheep economies. Well managed, forests cover the high hills and mountains, and there are large timbering operations. Lowland farms often grow wheat, and include large orchards of apple, pear, cherry and plum. The Cratlei Valley is Omaika is the fifth largest producer of wheat, exceeded by Sefaieri, Cuecha, Pasiana and Bunminidun Vosuget. Omaika is home to only 3,100,000 people, most of whom live in the alluvial Cratlei River Valley and the surrounding low hills. This river carries great volumes of water from the west Pruseia face and the Ifuno plateau. The French called this valley and the surrounding green hills appropriately by the name Verdeau. 17% of the population speaks French, 9% speak Pasan, and 71% speak Nacateca. The area around the mouth of the Cratlei see a number of finger-like ridge formations extending into the sea. The capital and the largest city is Nouvelle Paris, located on the left bank of the Cratlesi. 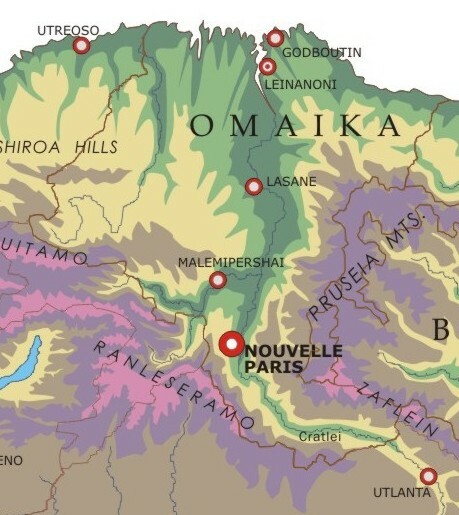 Approximately one out of every four people in Omaika live in Nouvelle Paris. This city was founded by French settlers in the late 1600's and still remains one of the most French cities in the land. The city has always looked to its namesake for inspiration. The architecture mimics Paris, as do even many of the street names. In the past two hundred years, numerous French criminals and political undesirables have sought refuge there. France has a consulate there, housed in the same wonderful mansion since 1866, which the popular wisdom suggests is a front for French police and intelligence. However, even with the heavy French influences, the majority of the population is atrei, though this has been very catholic city. Nearby are some of the the best skiing resorts in the country. There has also been a gritty feel to Nouvelle Paris, since it is near the coalfields and is economically dependent on related industries, such as railroading, electrical generation, and chemicals. The Omaikans are Nacatecan, but of a peculiar type. Pasans and Kulgin people originally occupied the area, but 2,000 years ago a group of Nacateca people migrated north from the Ifuno plain down into the Cratlei River valley. The migration occurred with the expansion of the Subanei empire, which was lead at first by the great prophet, Ierecina, the founder of the Shufrantei religion. The Omaika people descended from the Sulidun tribes of central Bergonia, east of the Ancita, who didn't easily accept the new Shufrantei religion. In later centuries the Omaika slowly converted to Shufrantei, but until now they have retained a unique cultural identity that sets them apart from all other Nacateca peoples, although now their dialect follows the prevailing national norm. The Omaika retain a very unique form of ballad, which involves a chorus singing six verse stanzas with the accompaniment of drums, horns and flutes. While most atrei men wear short jackets over a tunic and loose fitting pants, the Omaika have been accustomed to wearing a long coat jacket that buttons up the front over top of an undershirt and kilts. In style and manner the Omaika are somber people, but they love music and their lives are full of concerts, bands and recitals, and devoted agriculturalists.